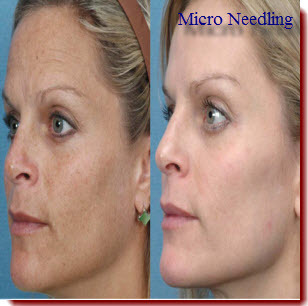 Micro-Needling – this treatment is also known as Derma Rolling. It is a treatment which helps in the rejuvenation of the skin and improves and reduces the appearance of scars, wrinkles, cellulite and even stretch marks. The device used to do this treatment is a small handheld derma roller, it is covered in tiny needles, which is then rolled onto the skin and creates small holes in the skin surface, thus triggering and stimulating the skins natural healing response. The skin becomes firmer and has a tight appearance in the areas that have been treated. The appearance of cellulite is improved as well as the appearance of stretch marks.